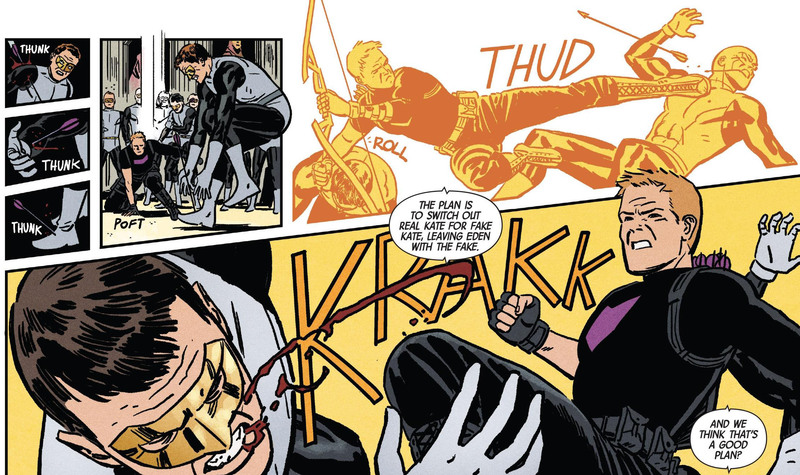 Plot: As Clint Barton, the original Hawkeye, travels to the West coast he finds himself in league with Kate Bishop’s three or four too many sidekicks. But with the usual discourse of our often-engaging Marvel comics, he quickly finds that Kate isn’t there. In Hawkeye #14 Clint hatches a masterful plan to find Kate, and bring her back, while attempting to throw two super villains off of their trail at the same time. He… doesn’t exactly get the result he’s looking for. 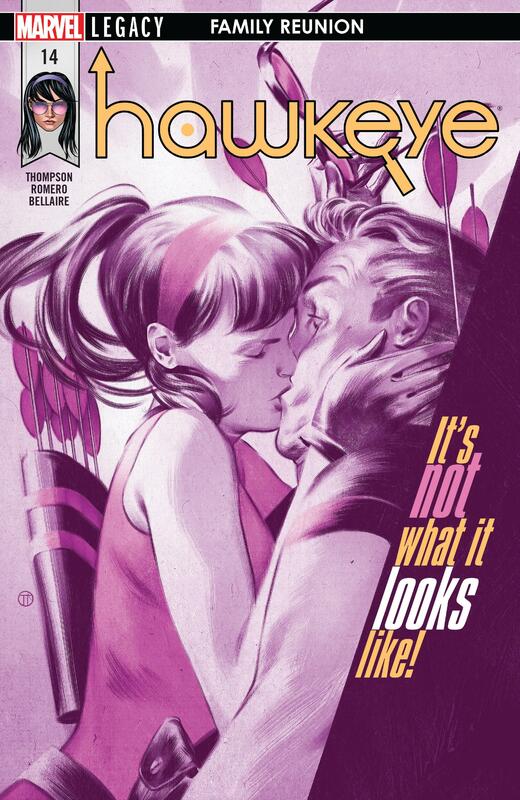 Story: Kelly Thompson has been doing a phenomenal job with Kate Bishop in the Hawkeye comic series. I really liked Kate before (in series like Young Avengers), but I fell in love with her and Barton truly in the Matt Fraction run of Hawkeye. While her style of writing is her own, she carries Kate’s personality over from her previous series and characterizes her so well. I like to call Kate Kelly’s spirit character. She seems to just channel “the awesome” so naturally. When she introduced Clint in the previous issue, I knew that she understood them intimately. So, Clint… He’s been more stoic in the past. The past before Fraction that is. He was always much more precise of a character, which in a poetic sense, should ring true given his talents. But when Fraction got a hold of him we saw him for the first time with his “hair let down” so to speak. He wasn’t in highly engaged “Avenger-Mode” he was in his in between, recharging state, where, while still highly skilled, actually showed some human flaw. Kelly focuses in on that, and she does it so well. From the smallest hints of character, we can see how much Barton and Bishop are alike and how much they are different. How they complement each other and how they inevitably end up arguing while in the heat of battle. We get such a fundamental picture of their relationship here, and the sense that Kelly really understands Clint. In his masterful plan filled with the take out of a rom full of armed “Masque” guards and a compelling rescue of his best friend, he elaborately orchestrates a ball of confusion for Eden… which backfires. I’ll let you read to find out exactly how. The point is that it works for story and character purposes and it makes the Hawkeye’s impossible to not love. Art: They art team is friggin’ perfect for this book. It fits Clint and Bishop so well in style… I’ll call it minimalist for lack of better term. There are details there, but only where we need them. The focus on the style is much more on expression, and anatomical grace, as opposed to the number of ripples in one’s jeans, for example. The action shots, and panel to panel fight work is always a treat. It’s one of the things I’ve loved most about this run of Hawkeye from issue #1. The slight grain in the mostly flat color style appeals to me as well. I think it’s amazing. The cover itself is also beautiful and very creative in its tabloid-esque style. I love the passion on “Kate’s” face, the surprise on Clints as well as the arrows around his head seeming to signify that he was pressed into this unexpected smooch. The purple sketch style shading works as well. I don’t really like covers that are misleading, and this one is very much that, but at the same time, I do like the irony of the large print reading “It’s not what it looks like!” In either case, I’m happy to have this in my collection. Verdict: This was a solid issue as has been pretty much every one in this series. Kelly knows Hawkeye, no matter which Hawkeye it is, and the stories continue to be compelling on a per issue basis. I was behind on Hawkeye for a while and binged a couple of weeks ago. I’m glad I did. 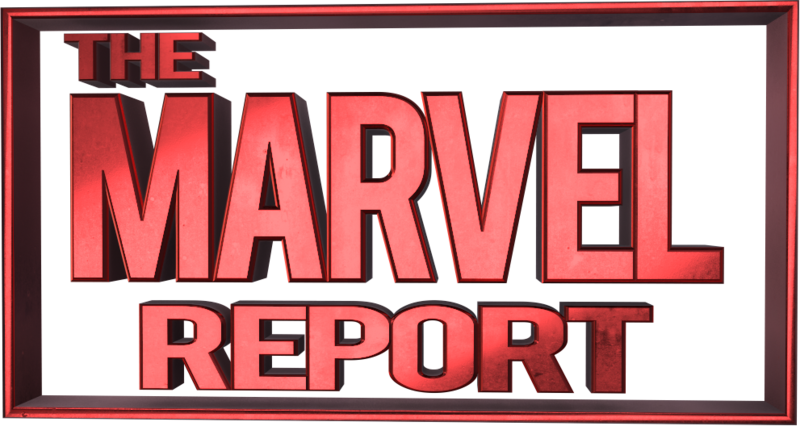 Put this on your pull list and continue to support this amazing work. Kate Bishop and the entire creative team behind her story, deserves it.